Sisters Therese Bangert (left) and Judith Jackson, Sisters of Charity of Leavenworth, have been long-time friends and shared many life experiences – including one they didn’t realize until a later conversation. On the bleak, gray day before Thanksgiving 2016, two independent acts of charity by two Sisters of Charity of Leavenworth (SCLs) intersected without their knowing it until a few days later. Sister Therese Bangert, SCL social justice coordinator, took a mid-morning phone call from an unidentified individual whose first language was not English. Despite the language barriers, Sister Therese understood that the man was a single parent of two children. He had just relocated to the Kansas City area from St. Joseph, Mo., and he told her the family had nothing. Sister Therese wondered how the man had obtained her phone number and concluded it might have been because she had helped some other families with furniture recently. However, those items were gone. Familiar with community resources, Sister Therese looked up information about Catholic Charities’ TurnStyles Thrift Store. She could hear the man entering the address into his phone. That same Wednesday afternoon, Sister Judith Jackson, chaplain with Catholic Community Hospice, made a quick, unplanned stop to pick up a form at her office. Returning to her car, she noticed a man with two young children. She offered to help and accompanied him on his search for vouchers to use at the thrift store. From the little girl, age 8 or 9, who had better command of English than her father, Sister Judith learned the family was from Guatemala and that the man had worked till noon that day. They had just received bread from the nearby emergency assistance center and would use the vouchers for clothing at the TurnStyles Thrift Store adjoining Catholic Community Hospice where Sister Judith offices. The emergency assistance center, thrift shop and hospice are all programs of Catholic Charities at its Overland Park, Kan., location. Sister Judith gave the man a donation from her own pocket. He told her she was a very nice person; in turn, she wished him every blessing. 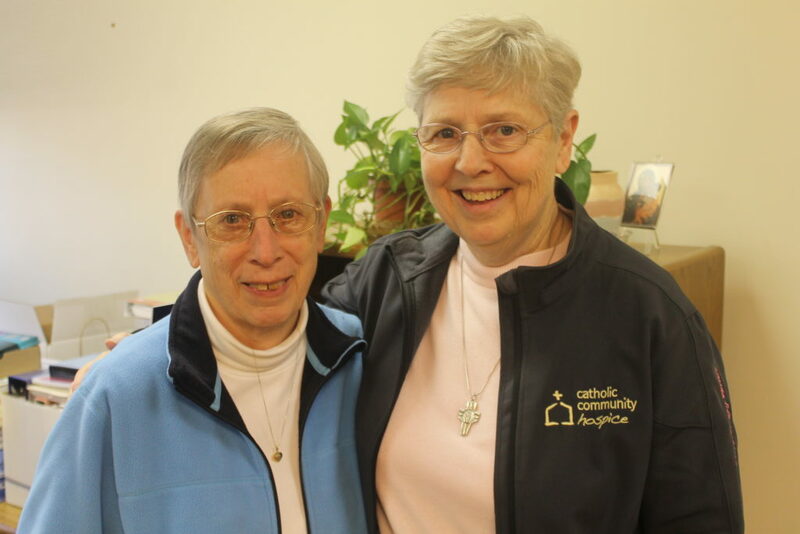 Sisters Judith and Therese entered the SCL Community in the same novitiate class in 1963. They’ve been friends ever since, but hadn’t gotten together for several months. The Sunday after Thanksgiving 2016, the two friends went to a movie. Later over turkey soup at her house, Sister Therese invited faith-sharing. Sister Judith told about her encounter with the family she’d met and helped a few days earlier. Sister Therese clicked in with instant recognition that there was a definite connection. Sister Judith had been the angel she had prayed would guide the man’s path. Some would call this fate. The two good friends call it Divine Providence and the spirit of charity that crosses all kinds of boundaries and breaks down barriers. Sister Judith was my freshman religion teacher at Hayden. So good to see here still making a difference. It’s wonderful to see you both.people don’t understand how often the Divine (come Holy Spirit come)steps in to help us out.